We all know that Easter is more than bunnies and Marshmallow Peeps! But how do you relate Christ's resurrection with your kids? Grab some fresh ideas eggsploring our collection of Easter resources. There's still time to pull everything together for Easter Sunday. The real message of Easter is Jesus. Acting out of Jesus' death and rising. Have kids answer questions out of plastic eggs, about Easter for prizes. Jesus ascended to Heaven and He will come again some day. 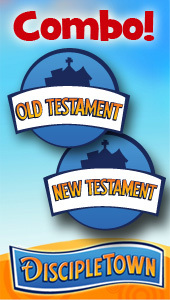 Use plastic Easter eggs to teach a Memory Verse. An object talk for Easter plus some info on the history of Easter to teach kids. Easter’s not about us. It’s about Jesus and what He did for us on the cross. Our kids love this puppet sketch! This is a great activity to do with large or small groups of children. We search the church while listening to the Easter story and end up with a fun surprise! This is a creative way for people in the church to form relationships with those in their community around Easter time. This is a pupet script that I used at our 04 Egg Hunt. Messy or not? uses eggs (messy) or plastic eggs (not) for relay or Egg War! Without Easter, there would be no Heaven for us to learn about. Uncover hidden messages pertaining to scriptures using the Hang Man Game. Great for Easter and Christmas. Draw a long line using yarn or masking tape (or draw an imaginary line). Have the children line up in a straight line facing the leader on the right side of the line. The right side of the line is called "In the Tomb" and the left side of the line is named "Out of the Tomb"
The color representation for each sacrifice and burden Jesus has taken for us. This fun object lesson helps kids to understand that Jesus took our sins upon himself and is the only one who can get rid of them. You can include this as part of an Easter lesson or any other time you might teach about Jesus' ressurection or the atonement of our sins. Once you have put your trust in Jesus and He has taken away your sin, you stay clean on the inside. This is the Good News we remember at Easter. Once you have put your trust in Jesus, He has taken away your sin and you stay clean on the inside. This short and easy object lesson gives kids a better handle on the truth that only Jesus' blood is able to remove our sins. Here is a very simple, yet POWERFUL play for children to do for Easter. Did you know that Easter is so important for Christians that we need a special time to get ready for Easter? Using either plastic or real eggs decorate eggs with the childrens names on them and some type of information from the bible, Example: The name of a Book, a person or place. Did you know Paul used a legal argument to prove Jesus rose from the dead? Here aare a couple resources that have been great to use for Easter when I have not had actors or super talented story tellers to help out. Spreading the light of Jesus using flashlights. Outback Jack learned the true meaning of Easter in this funny take off of the Crocidile Hunter. But our God is different. He is alive! Only He can hear and answer our prayers. Our God was different. He is alive! Only He can hear and answer our prayers. I think I will go and pray to the only true, living God. Here is a close up object lesson on the resurrection that is certain to amaze your class. Fun with eggs for older kids . What is in your basket that you can share? This is patter you can use with 20th Century Silks and a Change Bag as an object lesson in talking about Jesus' ressurection. This is ONLY the patter. You'll have to buy the tricks to know the secret. This is meant to be done on Easter, but you can adapt it to fit any time of year. You can't keep Jesus Down! A simple (cheap!) object lesson illustrating the resurrection. These are four monologues that can been done separately or in succession. Judas, Mary (once at the cross and another at the empty tomb), and Thomas.